Late Night with Seth Meyers | What's On Tonight? Seth Meyers, who is “Saturday Night Live’s” longest serving anchor on the show’s wildly popular “Weekend Update,” takes over as host of NBC’s “Late Night” — home to A-list celebrity guests, memorable comedy and the best in musical talent. From Universal Television and Broadway Video, “Late Night with Seth Meyers” is executive produced by Lorne Michaels (“The Tonight Show Starring Jimmy Fallon,” “Saturday Night Live”) and produced by Michael Shoemaker (“Late Night with Jimmy Fallon,” “Saturday Night Live”). 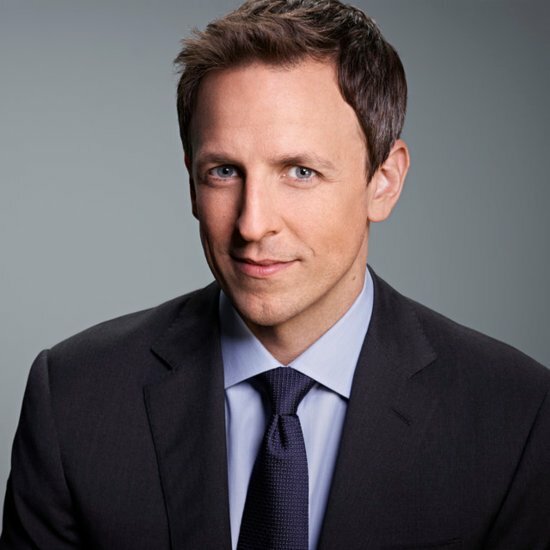 Emmy Award winner Seth Meyers will add to NBC’s extraordinary late-night legacy with the launch of “Late Night with Seth Meyers” on Feb. 24, 2014. Meyers began his TV career with “Saturday Night Live” in 2001. Currently completing his 13th season on the legendary sketch comedy program, he has served as head writer for nine seasons and “Weekend Update” anchor for eight seasons. Viewers recognize Meyers for his sharp wit, satirical commentary on topical events and newsmakers, and hilarious interactions with the wide array of guests that visit the “Weekend Update” desk. Meyers also lends his voice to Hulu’s animated superhero show “The Awesomes,” which he co-created with Mike Shoemaker. The show premiered August 2013 and quickly became a hit before being picked up for a second season. Meyers hosted the 2010 and 2011 ESPY Awards on ESPN and headlined the 2011 White House Correspondents’ Association Dinner to rave reviews. In 2011, Meyers won the Emmy for Outstanding Original Music and Lyrics for host Justin Timberlake’s musical monologue, and has also garnered 10 additional Emmy nominations for his work as a writer in television. Fred Armisen (born December 4, 1966) is an American actor, voice actor, writer, producer, director, singer,musician, and comedian. He is best known for his work as a cast member on Saturday Night Live from 2002 until 2013, and portraying characters in comedy films, including EuroTrip, Anchorman, and Cop Out. With his comedy partner, Carrie Brownstein, Armisen is the co-creator and co-star of the IFC sketch comedy series Portlandia. He also founded ThunderAnt.com, a website that features the comedy sketches created with Brownstein. Armisen’s work was recognized in 2012 with a nomination for an Emmy Award for Outstanding Writing for a Variety Series. 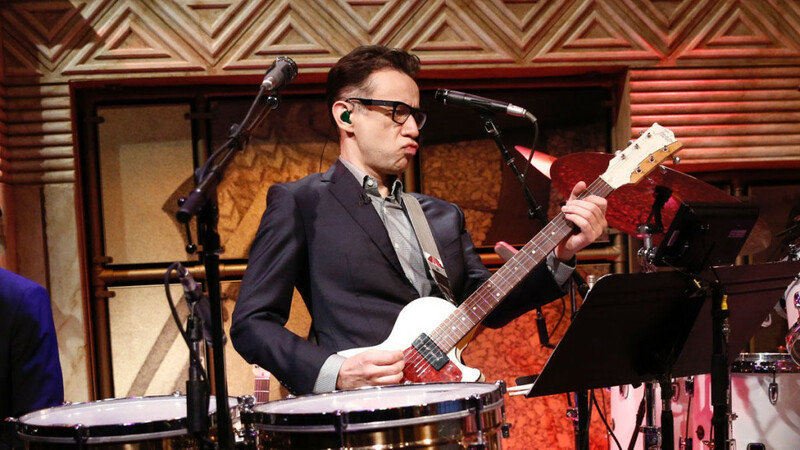 Armisen is also the bandleader for the Late Night with Seth Meyers house band, “The 8G Band”. 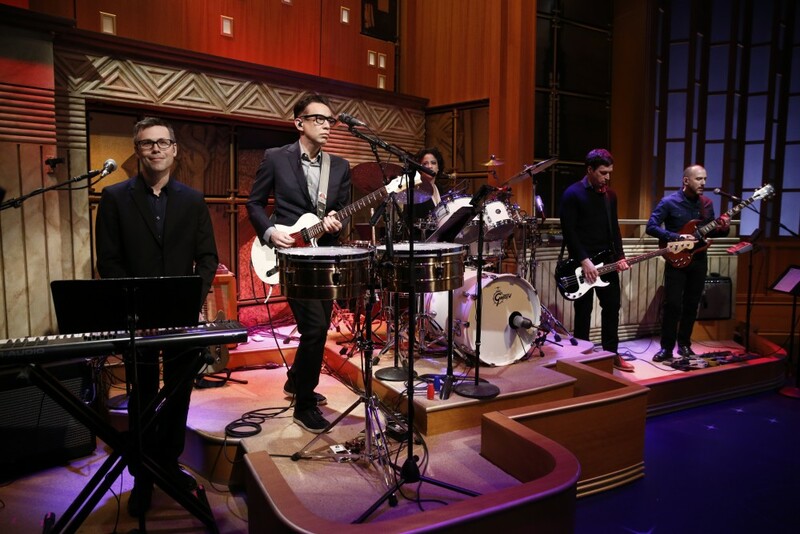 The show’s house band, “The 8G Band”, features members of the indie bands Les Savy Fav andGirls Against Boys and is lead by SNL alum Fred Armisen.